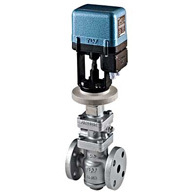 High precision control valves for vacuum steam, with pressure reducing valve as their base. By combining with TLV controllers SC-F70 or SP-F70, the rapid response blushless motor precisely adjusts the valve position to ensure extremely accurate pressure or temperature control, even in adverse process conditions. For steam processes required precision control of pressure or temperature.